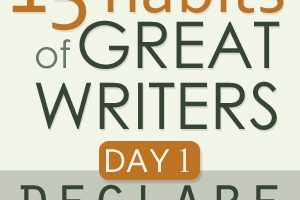 This is Day 1 in the Great Writers Series. The journey of every writer begins with a declaration. If you have written, then you are already a writer. Now you just need to keep writing. To overcome the demons of insecurity and create. The world is waiting for you to do this; it is in desperate need of your gift. So what are you waiting for? Start sharing it. Unless, of course, you are like most of us and you’re afraid. You’re hesitant for some reason or another. Maybe someone told you you weren’t good enough or that you didn’t have what it takes. Maybe you’ve told yourself those things. Do you know how you work your way out of such places? Of course you do. You already hold the key to escape from your own dungeon. You just need to use it. You have to call yourself a writer. Maybe you’ve already done this in some way (since I encourage everyone who reads the book to do it). But the truth is there’s always another level to aspire to. Always another mountain to climb — and with it another set of obstacles to overcome. So here’s what I want you to do today: Declare you’re a writer. Not just to your wall or computer or notebook, but to an actual person or institution. Someone or something you’re scared of — this could be a person who might reject or judge you, a family member who may misunderstand you, or a publisher who could discredit you. But tell them and tell them now. Do it with pride and boldness. Write about it, tweet it about, record a video if you want. The more outrageous it is, the more likely you are to believe. This is what we’re trying to do here: convince ourselves that we have the right to pick up the pen. Then tell the group about it here. The best stories (I’ll pick three) will win a free audio program about writing and platform-building I recently put together. Update: We’ve chosen the winners, but you can still buy the audio content (which is currently on-sale). And if you want to join the series, you can do so here. It’s not too late. What did your declaration sound like? Share in the comments. Thank you Jeff for this encouragement and this declaration challenge. I have worked on my day job for years as a mechanic. But I have always hated telling people I am a mechanic. Not that there is anything wrong with that, but for nearly 14 years now I have wanted nothing more than to call myself a writer. This passion came a little later for me, but it has been the clearest passion I have ever felt for who I want to be. Now I can say I AM A WRITER!!! Thank you, Jeff for giving us all the freedom to be our best selves, and to contribute our talents and voices to the world. I’m excited to join this community, and look forward to the next 14 days of challenges. Day 1 of the 15 day writing challenge! I officially declared myself a writer on Twitter; in public! Calling myself a writer still makes me feel like a tourist. A tourist of the worst variety. You know, takes bus tours, eats in only chain restaurants, fears the locals, and fears every three seconds for the safety of their password. Yep, that’s me. Wandering through the writing world with a fanny pack full of weird currency, wishing I was in the comforts of my living room. Tourist or not, I do know one thing for sure. I’m a fiction writer. Through and through. Writing about personal feelings, struggles, challenges, illnesses, family, travel experiences, giving birth, children, etc.is better left to the professionals. Let me dream up a character with a name, past, present, future, desires, failures, quarks, and dysfunctions and I’m a happy camper! I tried calling myself a writer a little over a year ago. I started a blog and got serious about working on a book. Then life got in the way, and I just called myself “Mom.” Now I’m ready to put my focus back into writing. I have a diploma hanging on the wall that shows my degree in English with a Creative Writing concentration. It’s time to put action behind it. I’m a writer. nevertheless, I am a writer. you, you will be transformed by His power. My solicitor asked my occupation for an affidavit and I said “writer”. It’s not particularly exciting, but it’s now listed on legal documents. And to think I had some strange notion that today we’d start off light and easy; you know, work our way up to the 15th habit. I guess I was mistaken. However, glad to have been so. I found today to be such the perfect starting point for what I’m sure is going to be a wild and woolly adventure of self-discovery, and personal challenge, as we all discover the truth trapped somewhere within us… that we are writers. Grateful for this journey. I say I’m a writer on my Linked In profile. Now, explaining WHAT I write is a whole ‘nother story! they live or die, whether I succeed or fail. on my way to being a writer. write because I am a writer! climbing, continue pounding out those words and with each one I proclaim . . . Thank you very much, Lisa! I am excited to continue too! I’ve been published. I’ve won awards. I’ve gotten to see the impact of my written (and spoken) words. But am I a writer? Really? It’s so much easier to say I’m a storyteller or a wordpainter…it’s so much safer. I haven’t said this out loud to anyone yet but I think from now on instead of referring to myself as a stay at home wife I will say “I am a writer” when someone asks what I do. I’m terrible at having confidence in myself and I know I need to work on that. Maybe by confidently declaring myself as a writer will help me change my attitude elsewhere. Okay, that and a pint of ice cream. Or just a smidge of chocolate. God has given me the means and desire to write, and therefore, I will write when the Spirit moves. Even if I don’t always hear His voice, I will continue to be obedient to my calling, placing words on paper each day…what a blessing…I’m a writer! Proverbs 18:21. I am a writer. The seed is planted. I have a hard time explaining to my children what I do for a living and today, I sat them down and told them, “Mama is a writer.” Sure, the 4-month-old drooled, the 3-year-old bounced around on the couch, but my magnificent 5-year-old told me he already knew I was a writer. Why? Because I act like a writer around my house! When I leave the comfort of my home, I become insecure. No more! I am a writer. I AM A WRITER! I told one of my Aunts that always like to put people Dreams down, and all she said was “I heard” and that’s it. I was happy to know it wasn’t followed with something negative. She always put people down and the funny part about everything is she says “she love people who chase after their dreams” I guess she has so learning to do her-self. However, I said and I feel better because she was my worst Aunt to tell about positive in my life. I’ve loved to write since I was a kid and was always told that I was good at it. It took me until three years ago to begin declaring that I was a writer–even though I wasn’t published, blogging, or anything–I believed it wholeheartedly! Several traumatic events have happened in my life over the past three years, and I put pen and paper away and decided I was NOT a writer. I even became very afraid to write. Recently, I have found myself discontent and “searching” for SOMETHING different in life. Just as I began to realize that the thing I’ve been looking for is WRITING, I stumbled upon Jeff’s book. I was excited…until I got to the end. Then I was just afraid. I signed up for the challenge, but really was afraid to make my declaration. As I began to share all of this with my biggest fan (my husband), he encouraged me to make my declaration on my (seldom used and very private) Facebook page. I did it with much fear and trembling…but I did it! I’m ready for the next step. Thanks, Jeff, for walking me through this. ones who find it the hardest to proclaim themselves writers. major book store, you can’t possibly be an author! you are an Author! Now, get back to writing…. Funny how just saying this is so difficult and also makes a world of difference. In the middle of a I am a writer declaring frenzy. One thing for sure, I am declared! I am a writer. I used to be just be a person who talked to myself. Being a writer is far less embarrassing. Here’s my post about it: https://susans140plus.com/i-am-a-writer/. It’s so hard to say “I am a writer.” It isn’t hard to say, “I am a teacher,” or “I am a mother,” so why do I choke on the word “writer?” I do say it sometimes, but not without a bit of a mumble. What a gift to have three weeks of challenges to sharpen my skills so that I can confidently say, “I AM A WRITER” and mean it. Today, for the first time, I told some one that I Am A Writer! I’ve told people before that “I’m working on a novel” but this is the first time I’ve said it that plainly. I was at the salon getting my hair cut and we were talking about books and I came out and said that I’m a writer. It was great to say it out loud! I am a writer…of and about my journey. Declaring I’m a writer is flat out scary. But I’m up for the challenge. After working all day and then taking notes for a script-writing meeting all evening, I finally got home and got a chance to meet today’s challenge. I declared myself a writer on Facebook. Now, that may sound a little too easy, but the fact is I’ve never really posted on Facebook about my blog or my writing. Facebook is full of friends and not-really-friends, teens in the youth group I help lead, fellow choir members, former church members, past classmates and co-workers, and the occasional current colleague. In short, people i interact with weekly and by whom i’d rather not be judged. And maybe six of them are really aware of my writing interests. But if I’m going to be a writer, they’re eventually going to have the option to judge my writing. So I declared myself a writer, and I let Facebook know by giving them access to my closely-guarded, still-working-on-getting-the-kinks-out-of-my-nervous-system-so-I-can-really-go-for-it blog. It seemed like a minor step, but it was a big one for me. A story of courage. You can do this! I just finished reading your book earlier today, and I have to say…I AM A WRITER! I changed all my social media profiles to reflect this, and my about page. Thanks Jeff! I began my blog in January. The urge was there, but my focus was not–I was a mile wide and an inch deep. In the last week, I have narrowed my focus and am further honing my sepcialization. I can already tell that becoming a writer is changing me as writing is pointing me toward my passion and clarifying my calling. I am a writer. When I write, I have clarity of thought and can problem solve better. That’s how I best communicate. That’s who I am. I reach to the deep places that I wouldn’t be able to reach otherwise. Words are my friends; sometimes my only friends. The pages I scribble on absorb the emotion. Emotions literally surge from my head (or heart), right through to my fingertips; whether I’m typing or penning. I am a writer. There’s no changing who I am, regardless of what someone else tells me. I know I am a writer because: I write, edit, write again, edit; people admire some of my writings decades apart from each other; I get inspired to write; I learn by writing; I journal about every day; I have a message – no, messages! My “outrageous” message that I am a writer was on FB – perhaps my first status update in over a year to many “friends” (most of whom are relatives). Family are those that know my weaknesses most. To tell them I am a writer would seem more outrageous than bearable if it were not for some of them having read or hearing some writings that have been very well received. I was once unable to say anything good about myself, my products, or my abilities but now I know that to deny these things is to lie and to withhold these is to deny others what I can offer. Some benefit from some of what I offer, some are entertained, while others will disenterestedly puzzle over why I write, and still others will disapprove. As I learn to focus on the first group, I will desire, commit, and be inspired, to write so much more. The first few times I introduced myself as “I’m a writer” when asked “So, what do you do” was freeing. I was no longer a contractor or salesman who wanted to write, I was pursuing my dream full time. I am a writer. Actually, we are writers. My husband, best friend, and I are writing our first novel. We declared it to the world via Facebook and twitter a few weeks ago. We also declared it to our families and received a great deal of support. Well, with the exception of my best friends two girls… they think our book is stupid! Declaring we are writers has brought some level of expectation that I didn’t foresee. All threw of us think we write well, but our friends are expecting greatness. And thats a tad bit scary! Failure is not an option, but the fear of failure is sitting on my front porch. This journey of being a writer is exciting, though, and I look forward to what it has to offer. I did it. Big smile and a happy sigh. My most honest response to your assignment today was not owning my identity as a writer, but speaking to my 20-something self about the writing dream I dared to say out loud once to someone I trusted and then listen to it be dismissed … laughed at. I am reclaiming that moment today. Thank you. Today I told my father that I was a writer. My father has never honestly given me any credit or believed in me for anything I have done and today I stepped up and told him that I wanted to write and my plans on writing a book about my weight loss journey. I have lost over 165 pounds and have been blogging at bendempsey.net about my journey for almost 2 years. I want to help others with defy obesity. WOW… I have goosebumps. I am only taking the time to read this NOW, at the tale-end of Day 1… And without knowing what the first step would be, I’m shocked to learn it’s already something I’ve accomplished over the weekend. I don’t know if he got it, but my husband’s support, & my own resolve, brought something to light. I already know this about myself; I just have to believe it & trust it. I’m a writer. I write. What an amazing man you have for a husband! Give him a big high five for me, please. He rocks! What a great story. Stay strong Andi-Roo! I am an Interior Designer. I have no trouble saying that because I earned it. I haven’t earned being called a Writer. But thanks to your book I now realize that I am both. I now proudly declare that I AM A WRITER. And just to prove it I changed my “About Me” section of my blog from “wannabe” to “am”. Then I wrote a post about the change https://design-revelations.blogspot.com/2012/06/i-am-writer.html Thank you Jeff! Today I found out I am allergic to bananas and that I am a writer. Now this made for an interesting day. It sure beat yesterday when all I found out was that I didn’t have any clean socks. Too bad I didn’t know about the writer thing yesterday. It would have made having to wear flip flops, on the subway, so much better. I ended up re-declaring myself as a writer over on my blog (https://slicedupfor.me/writing/2012/06/05/re-declaration-of-independence/) after falling halfway off the habit wagon. As for an in-person declaration, I ended up in a deep discussion with a professional writing friend about the value and viability of my proposed new editing service. I found myself a bit amazed that I felt so comfortable and confident in my professing my abilities to provide such but the shortness and conciseness of my beta-readers’ feedback speaks for itself. Writing encompasses both drafting and completing the work, after all. Fear of judgement is such an ugly thing which is why I thought I couldn’t possibly call myself a writer even though I have been writing since I was 11. Thanks, Jeff, for being part of the process. For reminding me of what I always knew was true. I am taking Jeff’s advice. I have wanted to be a professional blogger for a long time but was kind of embarrassed to say it. Two months ago we put the effort needed and started seeing results. So I took Jeff’s advice and started calling myself a blogger. I even started a website about being a professional blogger. Declare and Become! Ryan – It goes to show you that when you follow your heart, you can achieve pretty much anything. If you haven’t already read Napoleon Hill’s Think and Grow Rich, you should get a copy. Good, good stuff. 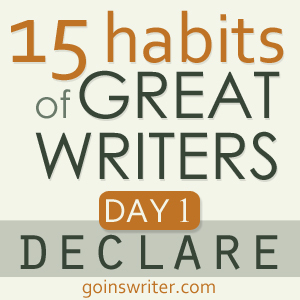 I love writing, but today’s declaration brought out a surprising response from deep in my gut. There’s a passion that I never spoke aloud until I tried to say, “I am a writer.” It’s something I’ve wanted my whole life, but only spoke of as a joke or passing whim. I am a SINGER! Wow, there it is. It’s all I’ve ever wanted to do. I’m continuing this writing challenge, but I’m excited to pursue my singing. To avoid calling myself a writer (because I feel Idon’t deserve it), I often say “I write.” As if that side-tracks it. And it look me a long time to even say that I write. A couple “very close” friends and my husband know I’ve been working on an e-book for quite awhile now; however, I’ve yet to say outloud that I’m a writer! I too am plagued with embarrassment, but mainly self-doubt manifesting into a serious lack of confidence. Not anymore! I told a couple of “fresh” faces today, and to my delight, they were intrigued…asking all the right questions. Tonight, I blurted it to my husband, who has himself been published and paid for writing, so I’m a little intimidated by him. His response was a big smile and, “Well, that was rather Tourette like.” LOL!!! 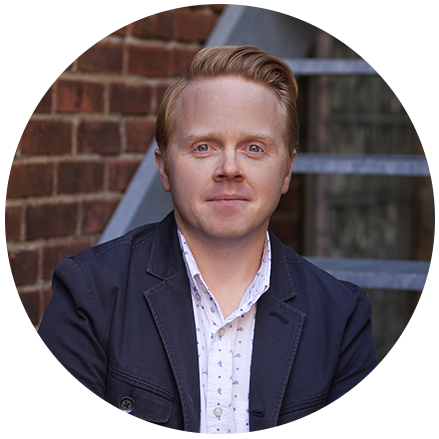 The first time I dared to call myself a writer was after I began following your blog, Jeff a couple of months ago. It was something I’ve always know, deep down inside, but I needed permission to believe it! Shortly thereafter, the Lord opened up a door for me and I was asked to submit a magazine article for publication considerattion. The request came in about 7:00 p.m. The deadline for the upcoming issue was midnight the same evening. I am not a fast crank it out type writer, but a slow contemplative one so this was a real challenge. About 11:30, still not finished, I had a meltdown. I knew I couldn’t get done in time. I wasn’t a writer after all. Who was I trying to fool? I stopped to pray and then check my email for a quick diversion. Your email with the title of your ebook popped up – YOU ARE A WRITER SO START ACTING LIKE ONE! This gave me the encouragement to finish and submit the article and it was accepted and printed!! Thank you, Jeff for your voice of encouragement! I’ve been hiding from my boss for a little bit that I blog and write because the content may be a little to close to home and ruffle his feathers! Woops. So, in an email, I linked to some of my content telling him that I write for my ‘real’ job. Ha! Will see what happens! Peggy: I’m with you: ignore the naysayers. Your cup will overflow with support here. What a supportive community to be a part of. I love this. It was such an incredible boost for me and encouraged me to tweet and post on Facebook: I am a writer. I’ve had a blog with great growth for a year. I’ve been asked to do many guest posts and have been complimented many times… but calling myself a writer was always hard for me to do. What a hard balance it is to be proud and confident in ourselves but still humble and willing to change. Thanks for the great encouragement! I realized that I had to declare it to myself first, before declaring it to everyone else: I am a writer! A little nervous when I pushed the publish button, but glad that I was able to face a fear in doing so. Looking forward to participating in the series! Went to a storytelling show tonight. Talked to someone sitting at a huge table all alone. “How’d you find this show?” I asked. “Well, I’m trying to be a writer,” he said. Then we had a great conversation about what inspires us as writers and what we write about. Today I declared to the one person who doesn’t believe in me that I am a writer! That person? Me, myself and I, of all people. Because after all, I love to write. I have entered contests, where I’ve won several honorable mentions, I’ve received high praise on course work, I blog almost daily, and today I wrote 1,000 words on my memoir in progress. So, I decided to tell myself to get over herself, and accept that I am a writer! There I’ve said it! I am a mom of 3, ages 7, 5 and 19 months. I work from home along with my hubs….and I am a writer. Wow. One of my biggest struggles as a writer is balancing my need to put words on paper and the many other roles I play. Most of what I write is done during naps or late in the quiet of the night. My declaration needed to reflect all aspects of who/what I am. Today I am a writer. Today I make my thoughts, my feelings, my heart known through these letters on this page. I will show who I am. I am a writer who pours out everything from the depths of my being into an unknown source, an unknown person, an unknown cause. Believing that what I do, what I say, what I write, will simply change a life. I am a writer because I can write, I will write, I must write. It is a way to change the past, to change the present, to change the future. I am a writer despite what you feel, think or say. Your thoughts, your words do not define this writer, cause I write for the greater cause for the greater purpose for the love, joy, and strength it brings. I am a writer. I am a writer who knows who she is, who stands for peace, justice and equality. I write for these causes because those who aren’t, they can’t, so they don’t. So I will stand with my words in hand, with my pen and my paper, blank as the sand to be filled up and given out like a cloud being filled up with water. It bursts and floods the earth and covers the land like the words on the page. I am a writer. BAM! Well, in the linked post, I explore what it would take for me to call myself a writer. I think it might be a little contrary to the spirit of it (sorry). But I get there in the end. Forgive me; I’m young and a bit cynical; so it’s hard for me to write things off easily. Even though I’ve published several poems, a few prose pieces, and written/directed a couple of plays, I have been utterly afraid to ascribe to myself the title “writer” outside of friends and other writers. So here goes: I am a writer. I have known this for some time in the dark. Now I am able to own my identity and say I am a writer, publicly in the light. I declared this to myself. Yes, it is hard to let this out in public, facing various questions, suspicious looks, but if your fears are the reason that stop you from doing what you love, then you and only you are your only barrier. So, I repeated to myself that I am a writer a couple of times during the day and when I came back home from work yesterday, I sat and write, as the most normal thing in the world, as what writers do, as what I, as a writer do. I saw this on a friends blog and was inspired to take a leap of faith…. When I told my husband two years ago that I wanted to write a book he was super supportive. He still is. If the subject comes up in a conversation folks react with surprise, and awe immediately followed by a lot of questions. That part feels good. I consider myself very new to the world of writing and I’m learning a lot but I wouldn’t have thought to call myself a writer, until now. During a chat with my “day job boss” I said it. I told him that I am a writer who also happens to sell…He’s heard me chatter on about various projects and he simply accepted my statement. This is a good thing. I started doing this exercise just after I started reading “You Are A Writer”. I’ve been doing it at every possible opportunity since… even in my regular job. The biggest leap, yesterday telling the president of my company that I was a writer and wanted to improve the company website, sell sheets and brochures. The risk… I was just hired as the VP of sales. I don’t fear failure. I fear success in the wrong things. I am a writer and the person the makes me feel like I am not is so often myself. So today I tell myself I am a writer not because I am some Shakespearean prodigy but because I write! That in itself qualifies me as a writer! Yes I did it Jeff! I haven’t written a novel or had any of my poetry or short stories/articles published. My best is that I’ve won various small competitions. My family have smiled indulgently at my efforts. I’m 76 years old as of Monday and yesterday I announced to my family that I’m a writer….Published or not. I write every day and will continue to do so until I can’t do it any more. I am a writer! I recently bought and downloaded your eBook – “You are a writer” and also the audio interviews and after reading and listening to your words I have finally managed after 20 odd years to declare myself as a writer. I started writing when I was young and now as a young Mum I am finally finding my voice again and feeling more confidant to tell people that I am a writer.And that is thanks to you.I find it so very scary but I have also taken the courage to enrol in University in a Ba of Arts – Professional writing and editing so that I have a qualifications behind my passion. thanks, Ami! glad you’re enjoying the book. and congrats! I started writing fiction only 10 years ago at 58 – before I wrote a word, I ‘got’ that I love writing and could write fiction. I declared myself a writer in front of 100 plus people and writing began showing up in my life! I wrote my 1st book in three months, got it contracted with a small press publisher in 24 hours and haven’t stopped. Although after the 1st book, the nasty ‘figuring out how to write better’ crept in. It’s taken nine years and five books in print to finally get back to the joy of writing ‘being’ a writer. Great post. I was a writer at the age of nine when I caught my Mother reading my secret box of words … that moment shorten the flow of the word river to headlines, book titles & images … I am NOW the very same writer at 49. First I declared the safe way. I posted on Twitter where I know very few people. Then I took the big leap and posted on Facebook. Friends, relatives, former coworkers, and “real” writers. Oh my! I have received the biggest reaction that I’ve ever gotten on a Facebook post: 22 likes and 18 comments so far. All comments have been positive except one neutral one asking what I’m doing–that was from one of the “real” writers. I feel uplifted and excited to embark on this journey. Thank you for the push, Jeff! I declared that I am a writer to one of my favorite blogs. Now I am working on a guest post! I made my declaration. I actually recorded a video. I posted it, even though I thought I looked terrible in it. But what I said and sang (!) was from my heart and it was the truth. I got a wonderful response from a fellow writer friend (Hi, Becca!) and lots of views of my post and likes on my Facebook page. The encouragement is incredible. I also declared it to my kids–they didn’t really know that I had started writing and that I have actually been published twice in the last month! I am a writer who can’t wait to see where this journey takes me! I’m putting together a FB page for my writer self and I’ve been asked to guest post by two writer friends, which equals more accountability, and more writing! Making my goofy video declaration was so much fun and the reaction to it has been nothing but positive. Hooray for writers! And I name-checked you, your blog and your book, Jeff! that’s cool, KC. Really cool. I am a writer. Always have been since the day I discovered books, paper,pencils and school. The word writer is friendly and easy, not pompous and full of expectations like author or blogger. I believe everyone is a writer because we spend our days telling stories to ourselves (although many of them of not true) about ourselves and the world around us. Sadly, many of us never write them down where others can be informed, inspired, and empowered by them. I believe so much in the power of writing that I now encourage others to write and even publish their work, not to necessarily become best sellers, but to become tellers before they die. Having said all that, I confess that my inner critic, Susie, still tries to discourage my writing. When she shows up I send her to the corner. choices to hide from the pain and lessons of failure. become overwhelming he made a new choice. A choice to look forward. the most wonderful, most fantastic and moving words he could imagine. his pen touched the page. And his heart was set free. This was awesome, it tells a lot about how we can feel. Thank you for writing and posting this! I am a writer. I will no longer listen to the lying impatient voices in my head which tell me otherwise. I am a writer. I will truly believe this even of it doesn’t make sense to me, even of the evidence all points to the opposite. I am a writer and anyone who has read this and hears me say otherwise don’t hesitate to correct me. I am a writer. Now. Always. I love this! Yes…you ARE a writer. Congrats! Before today when people ask me what I do, I told them my job. From today I will tell them “I am a writer….” and then details of my day job. At very least I will declare my profession to be writer. Because I am. That is a terrific idea, James! I’m going to do the same. Besides, whenever I say “business analyst” it requires a lengthy and tedious explanation. Writer is self-explanatory! well done, James! excited for you. I asked a friend who puts out a newsletter for nursery parents and volunteers if she’d consider letting me write something for the newsletter. Crazy how scary it was to ask even though she’s a very good friend. Crazy. I’ve been blogging for ten months. I try to write a new entry each weekday as it is now my official Mon-Fri 9-5 “job.” The problem? Well, problems? Firstly, the writing seems to flow somewhere around 11PM and with my chemobrain challenges, continues with edits and re-edits well beyond 2AM thus blowing the 9-5 gig. Secondly, I’m waiting for the writing police to show up at my door and arrest me for impersonating a writer. Or, for a blog reader to call me out in public as a fraud! I am a writer. 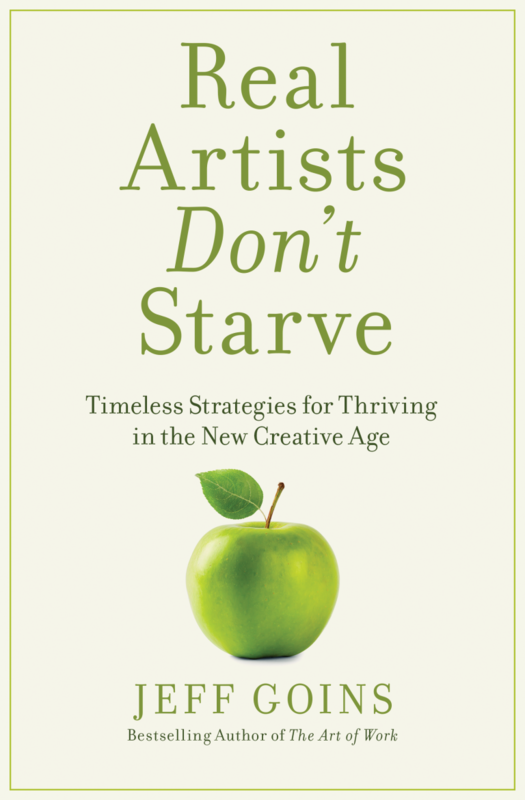 If not, then why am I work so hard to finish this non-fiction book before a conference in July. Now, it is declared and the next step is for me to believe it when I declare it. And the conversation continued. It’s awesome stuff. well done, Kelly! thanks for the comment. I’m a little behind in this challenge, but it is something that I desperately need. I have a hard time saying “I’m a writer.” For the longest time I assumed that to be a writer you have to paid or published. But I write daily. Whether it’s a blog post or a scene in my book. I write. Today I will say: I am a writer. Thank you for this wonderful challenge Jeff. This morning I attended a new networking group: Successful Thinkers. In the opening comments, besides telling those 19 business people I’m an artist working mainly in graphite pencil, I said, “I am a writer”, and went on to mention my completed middle grade manuscript (ages 8-12) which currently is under consideration with several publishers. I got positive feedback after the meeting. We each had 30 seconds to speak, so next week I’ll mention more of my writing venues. I have told people I am a writer for a year or so now, but since my first article was published in Faces Magazine in January, I notice I say it with much more conviction. I believe it, so others do too.